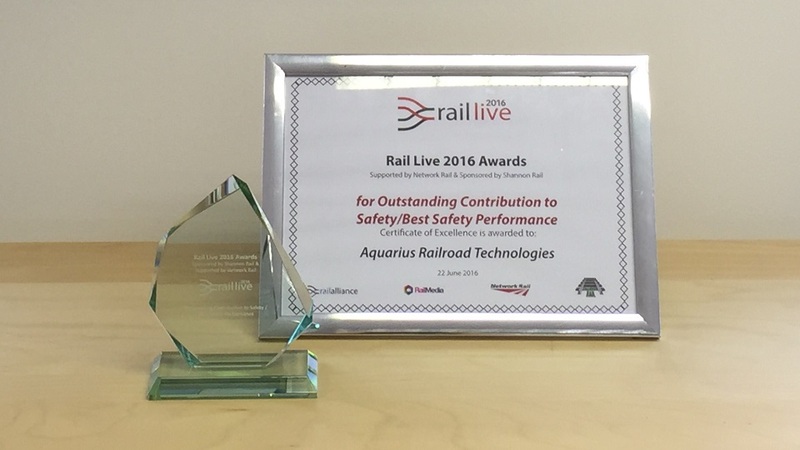 We are absolutely delighted and proud to announce that we received the Rail Live 2016 award for ‘Outstanding Contribution to Safety Rail Live/Best Safety Performance’. Awarded at the Rail Live 2016 award ceremony in Stratford on 22nd June during Rail Live. Rail Live is the UK’s largest outdoor event with which sees 6,000 visit 200 exhibitors. Aquarius exhibited a prototype Road2Rail Welfare with AJC Trailers, our R2R Plant Trailer loaded with the new T-Vac vacuum excavation unit, mobile mapping with Severn Partnership and a R2R Site Investigation Vehicle in partnership with Aspin Group. We also had live demos on track which gave visitors the opportunity to drive an Aquarius R2R4x4. The event was a great success and we would like to thank all who visited the Aquarius stand. Thumbs up from Pete Waterman! Aquarius has established itself as a market leader providing quality 4 wheel drive Road Rail Vehicles for track maintenance in the Rail industry. Our Road Rail Vehicles are designed to save our clients’ time and money. We provide efficient and cost effective solutions for track maintenance.